What is Directors and Officers Insurance (D&O)? CMSA’s Standards of Practice for Case Management, serves as a unifying force for professional case management practice by providing a common understanding and application of the role, process, and expectations. The Standards serve to drive best practice accountability for individual professional case managers as well as for organizations. This online course is designed to enhance understanding by expanding on these common principles to deliver a more unified education to professional case managers creating quality skill sets across the healthcare continuum. The coursework embraces the case management care continuum in any work environment, which contributes to consistency in foundational case management knowledge and a long, sustainable workforce. The course is made up of 16 online modules each representing the sections of the CMSA Standards of Practice, including one on each of the 15 Standards. Each module contains a detailed narrative with enhanced explanations of that Standard including bibliographies, references, and a professional video presentation of that narrative content with downloadable slide handouts, which incorporate case scenarios showing real-life situations in order to better understand that Standard. At the end of each online module, a quiz must be taken and passed to verify your understanding of the content. Upon completion of all modules, a Final Exam with a passing grade is required to complete the course and earn continuing education credits. CE certificates are issued upon completion within your online classroom. Case Management Departments looking to build a long term sustainable workforce that advocates for standardized practice in order to produce positive case management outcomes. New case managers entering the field and looking to become proficient on the Standards of Practice for Case Management. A case manager looking to enhance their case management knowledge and earn continuing education to meet their licensure or certification requirements. Recruiters who want to learn more about case management for a more consistent and concise process of identification, selection, orientation, and on-boarding of new case management staff. This course is pre-approved for 32 hours of continuing education credit for RN, SW, and CCM. 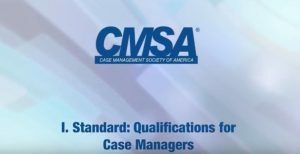 Expand knowledge of the CMSA Standards of Practice for Case Management guidelines and standards. Educate on common industry terms and how they should be used in the case management profession. Demonstrate the use of the standards through case studies. Create consistent delivery of case management related services. Are you a student? Contact us to ask about how you can get the member price and a student membership! To request information on pricing and registration for a group of 25 or more trainees, click below for more information. "This was an extremely helpful training. I would strongly recommend that my case management team has the opportunity to take the course." "The course is very descriptive informative. The scenarios helped to see the CM work in action." "It was great education on what a case manager is what their role and responsibilities are."